If you watch Better Call Saul and watched Breaking Bad then you know who Hector Salamanca is and now there is a beach towel that shows Hector like we have seen him in many episodes of Better Call Saul. 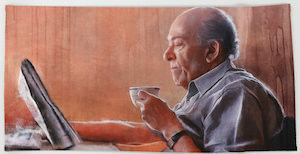 The Better Call Saul towel shows Hector Salamanca reading his paper and drinking his espresso while his drug handlers are dropping off the money they collected. The Hector Salamanca towel is 74 x 37 inches making it nice and big and perfect for the beach where people may look at it as it is something completely different than what you expect at the beach. And if a beach towel is too big for you then you are in luck as it also comes in other towel sizes.